On the morning of June 30, 1863, Col. Joshua Lawrence Chamberlain, awoke with the aftereffects of the heat stroke he had suffered while marching the day before. Chamberlain, 34, was a professor of rhetoric at Bowdoin College who spoke seven languages, but had always wanted to be a soldier. He had asked for a leave to join the army the year before but was denied, so he applied for a sabbatical to study language in Europe. When it was granted, he went instead to the Governor of Maine, who commissioned him a Lt. Colonel in the newly formed 20th Maine regiment. Instead, Chamberlain used his rhetorical skills to persuade 114 of these men to join the 20th Maine, which had lost more than 700 of its original strength of 1000 men to battle and to smallpox. This was one of those destiny moments in history; two days later, Chamberlain and the men of the 20th Maine would save the Union army at Little Round Top. Another key bit of destiny was in play the day before the battle. 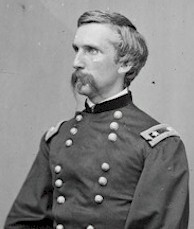 Union general John Buford, a cavalry officer who loved the western territories, didn’t know how to curb his tongue, which has never been a good survival tactic in Washington – it got him assigned to a desk. Just two weeks earlier, he had won command of a cavalry troop of 2500 men and 6 cannons. His orders had been to shadow Lee’s army from a safe distance and communicate their movements back to the infantry. But Lee had changed directions during the night. Suddenly, at noon on June 30, as Buford rode into Gettysburg, that safe distance was gone! He was faced with Confederate general Harry Heth’s column of 8000 infantry entering the town. Then, incredibly, Heth retreated. Buford correctly reasoned that Heth was under orders not to attack until the troops were in place with greater strength. He could see that the heights around Gettysburg offered excellent field position and whoever occupied them first would have a huge advantage. He had seen the slaughter that resulted from fruitless charges against such positions. He sent couriers galloping to the main force and ordered his own vastly outnumbered troops to dig in and prepare to hold until help arrived. This entry was posted in History, Movies, Travel and tagged Civil War, history, movies, travel. Bookmark the permalink. I’ve saved your posts so I could read them all at once on this auspicious day. You reminded me of the enemies seldom spoken of — heat and pestilence — that cost so many lives on top of those claimed by the war. I think about those soldiers in their wool uniforms as our thermometer creeps ever closer to 100 and wonder how so many made it through. And thanks for the Sam Elliott fix. Always a treat. Using the search engine I wrote about in an earlier post, “Finding Your Civil War Ancestors,” I probably clicked on two dozen regiments, and in every single case, the number of deaths from “fever” was greater than the number of deaths from battle. In researching this series, for instance, I found that Chamberlain’s 20th Maine sat out the battle of Chancelorsville because they were under quarantine after a smallpox outbreak.